Last Christmas my sister brought dessert to our family get-together. When she told me what she was making, I’ll admit, I was a little skeptical. And then I ate some. And went back for seconds. 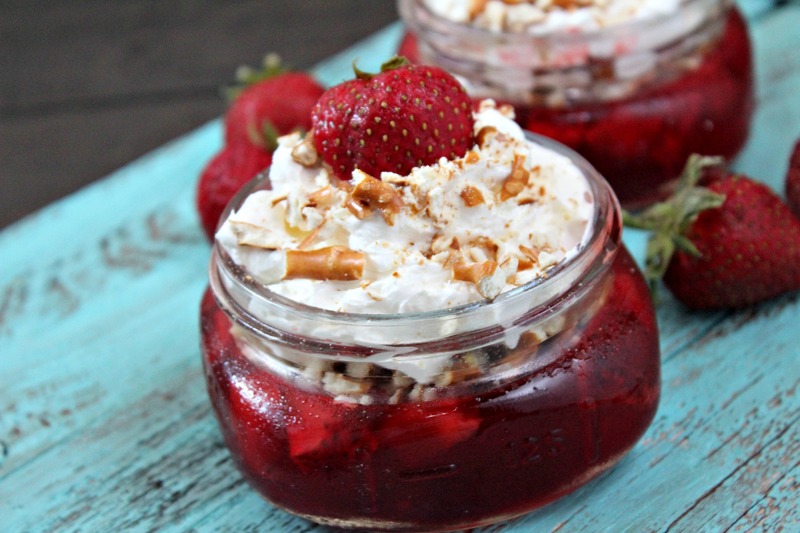 Have you heard of this Strawberry Pretzel Salad? One – it’s not a salad. And B) apparently everyone has heard of it. Except me. I’m sure I’ve seen it before but put it out of my mind. But am I ever glad that my sister brought this to the party. The salty pretzels with the gelatin and then a sweet whipped cream – yes, please! And I’m even happier that I saw on Instagram that some Weight Watchers users have made this into small portions. Of course, they made it into four portions but I made it into two because, well, dessert! And small batch desserts for the win. Cuteness abounds. 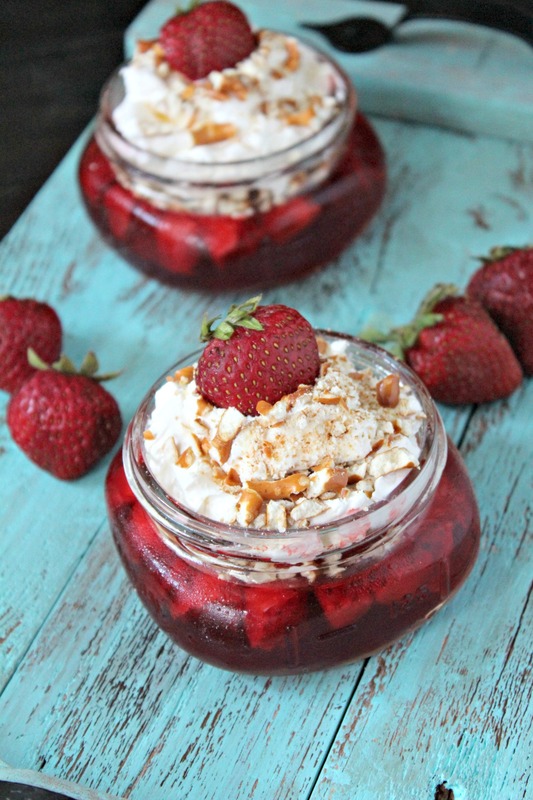 Divide strawberry gelatin among two wide mouth mason jars. Add 1/4 c boiling water to each jar. Mix together until dissolved. Add 1/4 c cold water to each jar and continue to mix together. 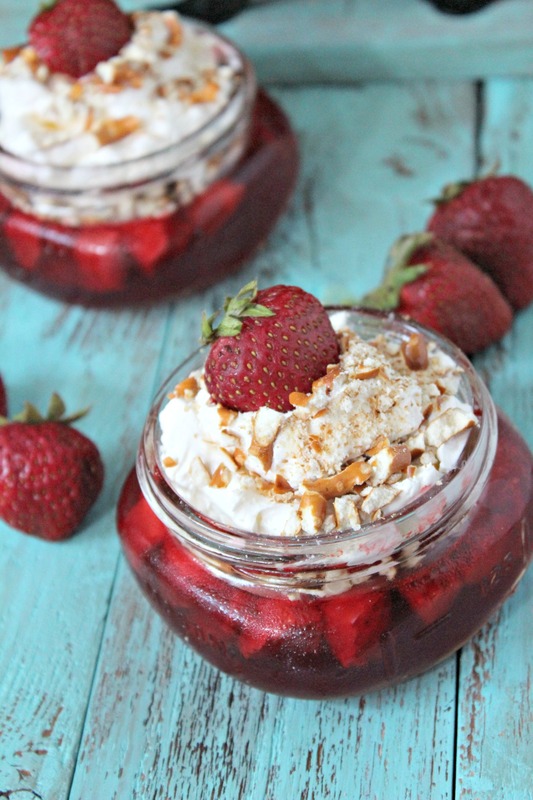 Add strawberry pieces to mason jars, reserving some for topping. Cover with lid and place in refrigerator to set for a couple of hours or overnight. When ready to serve, crush pretzels and divide among mason jars, reserving some for topping. In a medium mixing bowl, add softened cream cheese, almond extract, and stevia. Beat with an electronic mixer until combined. Add in whipped topping an fold together. Divide among mason jars. Decorate with pretzel pieces and strawberries.